Any Other Red Cooper 35's Out There? Just wondering if anyone one else on TMF as a red Cooper 35 Edition? 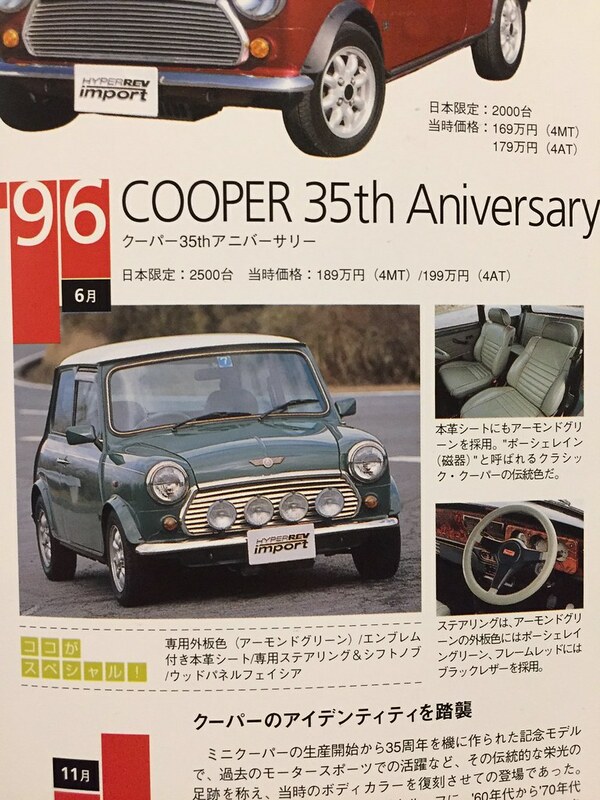 It's a JDM and until I started to talk to the super helpful Cooper 35 register lot (hello if any of you are on here too) I thought all Cooper 35's were that tasty Almond Green colour but in Japan there were also red ones, which because they're red look a bit like the Monte Carlo LE. Its been off the road for years now, undergoing a full renovation, trying to keep it original as poss (but there's next to no ref for it) but hopefully 2019 is when it'll be back on the road, it's close. Edited by Pops_Guild, 30 January 2019 - 03:45 PM. Never seen a red one, looks lovely though! Yeah me too but the Cooper 35 Register have details of them being in red, and in Rover Japan brochures. Here's the pages from the Rover Japan C35 brochure, inc the spec sheet where the red with black interior option is there. The pdf of the full brochure is too big to post here. Also some pictures of ones I've found in NZ and Japan. Edited by Pops_Guild, 31 January 2019 - 10:38 AM. I suspect mine "may" be one. Would the red steering wheel and gear knob be standard on the red ones does anyone know or was that a selectable option? Mine black and white/cream. I've heard a story on another forum that someone only realised he had one when he took out the dash and found some kind of label stating it was actually a "35". I'll be investigating myself soon but is there an easy way to find out? A particular range of ID numbers or the like? That story was me :) Was the label shown. It matches the labels that other JDM C35 (green) owners have except it's its interior is spec'd as Black. Also attached the translation of the Rover Japan Specification sheet I posted earlier. The red steering wheel and knob were part of the spec, I haven't found anything to suggest that there were other options for this LE....but as we all know, owners tend to make their Mini's there own so someone may have swapped them out. A lot of repatriated JDM Mini's come back over to the UK with modified bits. Edited by Pops_Guild, 31 January 2019 - 02:42 PM. Small world indeed. Can I ask, where exactly did you find that label? Was it at the back of the glove box? Cool...engine number will be key. You got any pics, inside and out? I assume yours is a Japanese model too? That label was stuck on the back of the glove box, you'd have to remove the wooden dash from the car to see/get to it. Mine was only loosely stuck on and it fell off. Edited by Pops_Guild, 31 January 2019 - 04:32 PM. Is there a range for the engine number or how does it work? Yes, she's a Jap alright. Still trying to figure out how to post pics from an iPad but the only difference between my interior and yours is the steering wheel and gear knob. Also mine has the walnut trim on the doors and on the back windows. I think I'm a member of a FB group I set up and may have been talking to you previously. Are you R.C? If I can't figure out this picture lark here I might touch base with you over there. I'm based in Ireland if that rings any bells with you. Well as you have a JDM car it's going to be pig for you to find the number unless it's on your Ireland equivalent of the UKs V5. On your JDM the Alternator will be mounted above the AC compressor on a special bracket. The alternator + bracket combo basically sits right over where the engine number stamping is. To make matters worse this age mini the stamping is dot matrix so really easy for it to rust up and be hard to see. It might be possible to get under the alternator and clean it up and get your phone into the vicinity in order to snap the number...good luck. Else it's a alternator removal job which is a pain on JDM cars. There are a good number of Rover Mini prefix's but only the ones above would be C35's. Happy to chat over on the FB group too but there's a lot of v. knowledgeable folks here so good to keep this up to date too. I think the wooden door cappings were an option on Rover Mini's, mine had a wooden wheel when I got it, that's common on JDM cars. I haven’t checked the plate yet but is this likely to have been a typo back at registration date 01/09/2014 ?. Edited by Fastorq, 07 February 2019 - 08:04 PM. Could be a typo. I’m not an expert but I don’t know of a Mini engine prefix ending in E124. Only real way to know is look at the actual numbers on your engine. The porcelain green wheels and gear stick come up quite often. If you’re part of the Cooper 35 Register on FB, they appear there quite a bit. A guy called David Ainley, who lives in Japan finds them.